“Tom the peacemaker is back,” Edith Crawley says after a contentious dinner, and she’s right. Over the years, Tom Branson has been smoothed and sanded down, all his rough edges and pointed opinions polished into bland amiability. “I just want what’s best for everyone,” he promises when Edith suggests he’ll unseat Mary as estate manager. “Can I put in a word for trying to remain friends?” he jokes when Isobel and Violet squabble. 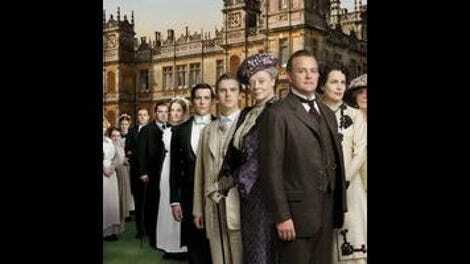 I’ve said before that even as it portrays an era of transformation, Downton Abbey resists change. Yet Tom Branson has changed tremendously. The unabashed socialist vanished, replaced by an ardent capitalist spouting the virtues of a bootstrap economy. 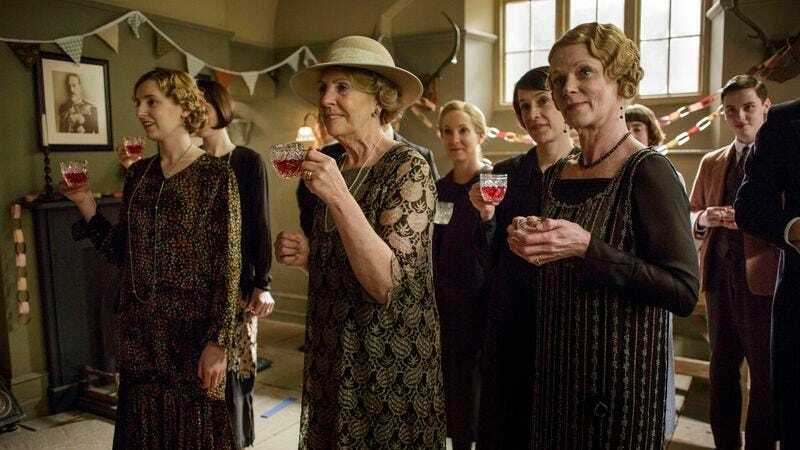 That’s the kind of change Downton Abbey welcomes, the kind that shields it from examining systemic exploitation and bolsters the fiction of the Crawley’s essential righteousness. This episode pays lip service to the benefits of social mobility, but the show’s sympathies lie with the mighty and powerful. Rose Leslie returns as Gwen, housemaid turned secretary, now working with her husband to promote Hillcroft College, where young women of modest means better themselves. The Crawleys don’t quite recognize her—they know nothing—after her 11-year absence, but Daisy grouses, “They don’t look us in the face.” Gwen (as likable as ever) isn’t sure how to broach the subject, but in a flood of resentment, Barrow outs her to the entire luncheon party. It’s a great soapy moment; I gasped and swore. Gwen credits Lady Sybil with her rise from housemaid. “She did everything, looked out for the jobs, lent me clothes, drove me to the interviews.” Sybil’s unflagging support let her take the first steps out of the servant class, but this account elides more than a decade of Gwen’s hard work. Sybil helped a housemaid become a secretary; that secretary moved on to local government, and now uses her hard-won advantages to help other young women. Instead of recognizing Gwen’s achievement and generosity, the episode celebrates Sybil’s. With Tom a capitalist, Daisy is Downton Abbey’s voice of the working class, and she’s a disappointingly silly one. Hearing that the Crawleys intend to lease out Yew Tree Farm, Daisy moans, “I feel so let down!” but the only person who let Daisy down was Daisy. Letting her hopes run away with her is a dramatically plausible scenario, and it gives Mrs. Patmore plenty of snappy comebacks (“All right, Madame DaFarge, calm down and finish that mash!”), but it also indulges Downton Abbey’s habit of sidestepping even the likeliest and most justifiable conflicts between the Crawleys and their dependents. While Daisy’s facile political outbursts invoke the injustice of the faltering manor economy, this plot suggests that Mr. Mason’s troubles spring less from structural exploitation or a collapsing system than from Daisy’s hotheaded temper and her flighty, foolish assumptions. Even as Daisy fumes, Cora maneuvers the menfolk into giving Mr. Mason the tenancy, plying them with the memory of Sybil, and Daisy’s furious confrontation is forestalled by Robert’s congratulations. Again, it’s dramatic, but it imparts the dubious unspoken moral that if the working class would just shut up and stop making demands, they’d be looked after by fundamentally benevolent masters. Her previous belligerence undermines Violet’s declaration that “the point of a so-called great family is to protect our freedoms.” If the Dowager Countess had bothered to say this at any of many, many board meetings or dinners, she’d have made more allies and more progress. Instead, she squawked with increasing petulance at being crossed. Not only political plots reveal Downton Abbey’s skewed adoration of nobility. It’s also evident in whose stories get told, and how. Anna’s first trimester plays out as expected, with groaning and gasping and a hasty doctor’s visit. But this chapter of Anna’s pregnancy isn’t really about Anna at all; it’s about Lady Mary. Coming on the heels of Gwen’s revelations about Sybil’s generosity, Anna’s emergency distracts Mary from a chastening bout of soul-searching. Anna’s close call gives Mary a reason to take up Henry Talbot on his offer of “lunch, or a drink, or… something” (with emphasis on the “something”) in London. His surprise appearance at Downton, and Mary’s startled confusion, is one of the great pleasures of the episode. She’s visibly thrown, shooting nervous glances between Henry and Tom, then staring off into space. Even after she collects herself, she shimmies with excitement as she tosses off sallies. Poised, confident Mary is a force to be reckoned with, but uncertain, unsettled Mary is a lot of fun to watch. In Henry, Downton Abbey has got an upstart it can be comfortable with. Handsome, from a titled lineage, affluent (his prospects are “adequate if not overwhelming”), with plenty of leisure for racing and white-tie dinners, Henry Talbot represents a different kind of social mobility. Like Mary, he keeps pace—in his case, literally—with the modern world, maintaining the old ways and improving on them. Improving on the old ways is really what Downton Abbey aspires to, no matter how many personal or societal changes it unfolds. In a literal example of social mobility, the Carsons move from their modest servants’ rooms to a cottage, a change commemorated by Carson’s silent farewell to his long-time bachelor quarters. But when family and staff stumble over the housekeeper’s new name (“Mrs. Carson,” Rosamund says, “it’s like Jane Eyre asking to be called Mrs. Rochester”), the two volunteer to remain Mr. Carson and Mrs. Hughes in the manor. Some things never change. Downton Abbey thinks that’s a virtue. “No more Miss Buntings, if you have any pity.” Agreed. Bates can be a gloomy cuss, but Brendan Coyle’s guffaw of joy upon learning Anna’s pregnant is endearing. Violet’s high-pitched ascent into incoherence at dinner had me concerned for her health. Rosamund’s remark that “Mama’s slipped away” from the Carsons’ welcome-home party didn’t help. Robert’s still having pains, and still attributing them to his ulcer. Rosamund, maybe cool it with the jokes about his funeral? Gwen: “I never had any higher education, and so—” Mary: “Who did? All we were taught was French, prejudice, and dance steps.” And to interrupt guests who’ve been asked to explain their passion for educating disadvantaged young women. “I know Lady Mary didn’t like being made a fool of.” Oh, Mary, when Barrow counts on your support, you know you’re in the wrong. “The Bateses are off the ’ook.” Sgt. Willis, if you never show up again (we know you will), it’ll be too soon. “Mary needs more than a handsome smile and a hand on the gear stick.” Oh ho ho, does she?